The work tray is made of clear plastic polycarbonate" thick and attaches easily to all types of wheelchairs with hook and loop straps. 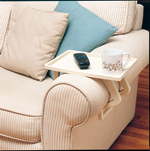 This wheelchair tray is not only attractive but offers the user an unobstructed view of the ground for safer wheelchair operation. The aluminum trim on the plastic work tray acts as a lip to keep items from falling off. This durable wheelchair accessory measures 19" x 23 ½" with an abdominal cutout measuring 15" wide.